It’s another beautiful day in the Pacific Northwest! 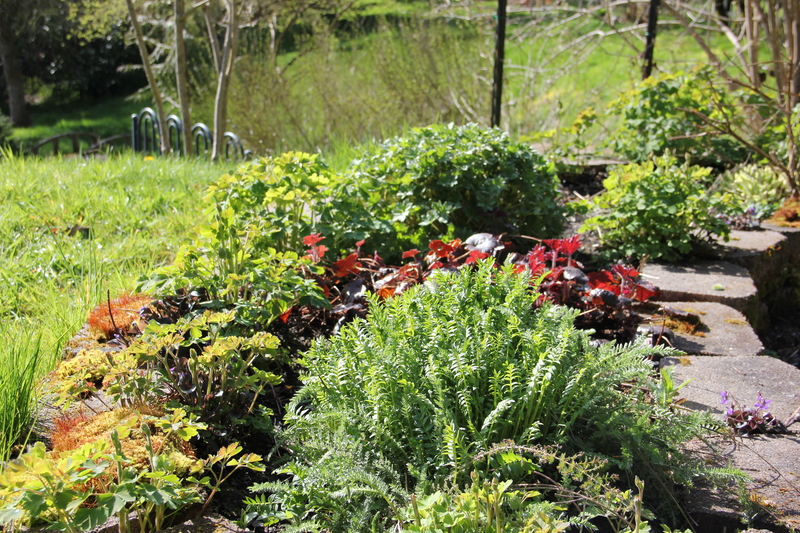 Our perennial beds are thriving in the sunshine with their mounded green foliage and just the beginning of first flowers. 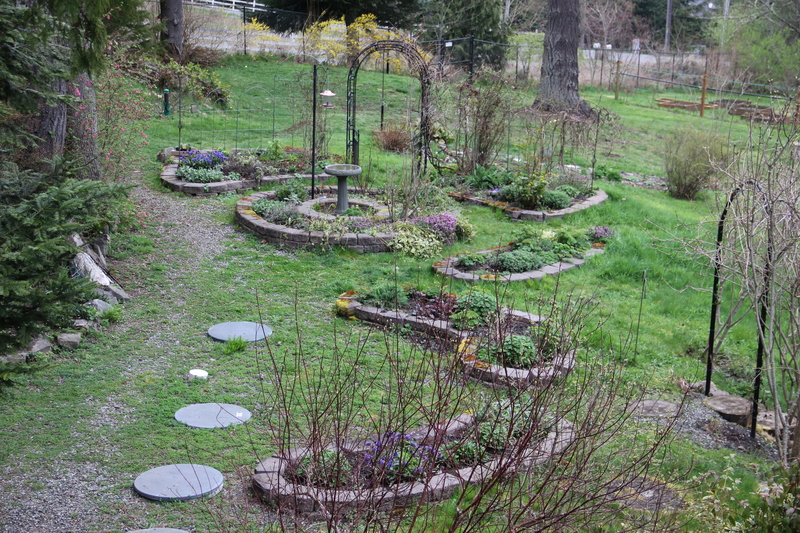 I’m pleased that we can view the changes in this garden through the living room window and from the deck. Nothing replaces getting out and poking around the beds, though! Among the blooming vinca, anemones, profuse lamium, and deep purple pulmonaria, the clumps of columbine are just sending up flower stems. It will be fun to see what varieties and colors of columbine this garden contains. I’ve only grown wild red columbine, which was naturalized in our Virginia garden. 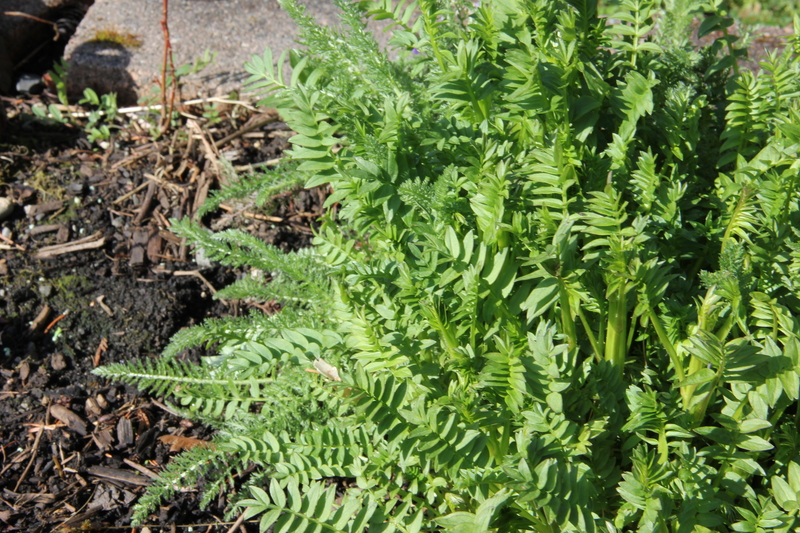 I know most of these perennials by their common names, and it’s cumbersome to always list the Latin. Eventually I should probably learn to list them properly with both names and with correct capitalization, although there are so many exceptions to capitalizing plant names… and so many parentheses suggested. For now I just jump between common and Latin names, depending on what is better known. So far I can identify vinca, lamium, lamb’s ear, Jacob’s ladder, anemones, salvia, coral bells, yarrow, pulmonaria, delphinium, euphorbia, and geraniums. 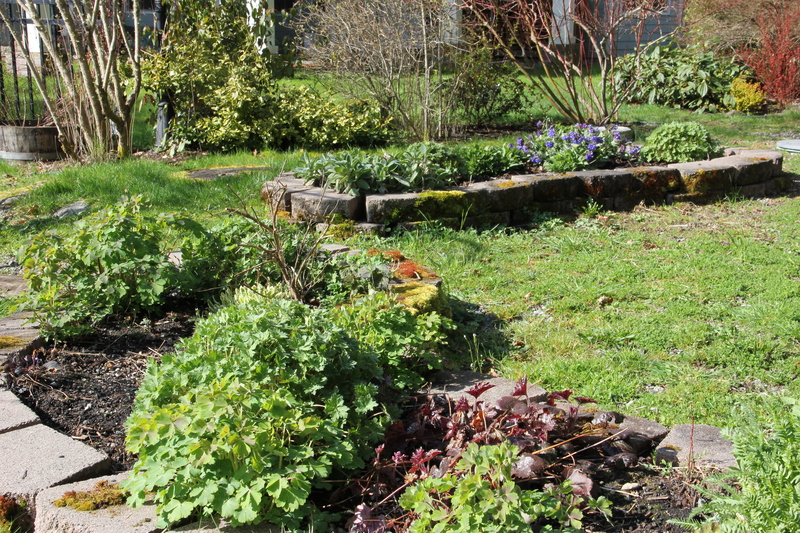 I’ve noticed between two and ten of each plant in these garden beds. 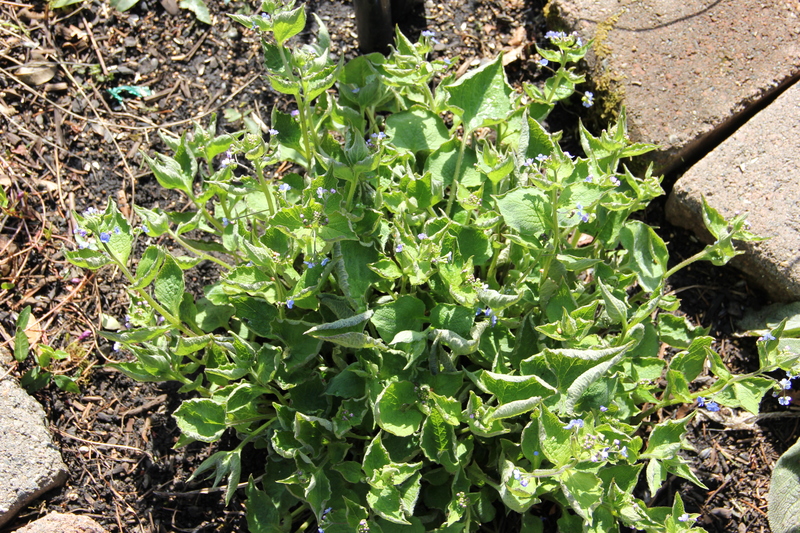 I was unfamiliar with the below tiny blue-flowered plant, but have learned it is Brunnera Macrophylla or Siberian bugloss — not a very pretty name for this sweet specimen! It is also called false forget-me-not. The leaves, which grow more heart-shaped later in the season, have a tendency to curl, and the delicate sprays of flowers are long lasting. This entry was tagged brunnera macrophylla, columbine, Coppertop, gardening, heuchera, jacob's ladder, lamb's ear, lamium, Latin, Olympic Peninsula, plant names, pulmonaria, siberian bugloss, vinca. Bookmark the permalink.